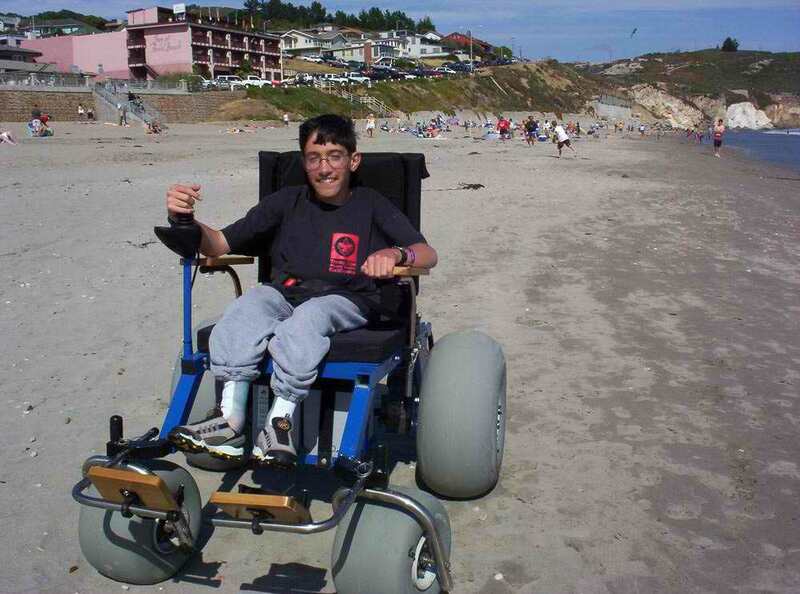 Beach wheelchairs provide accessibility to the coast for the mobility impaired. 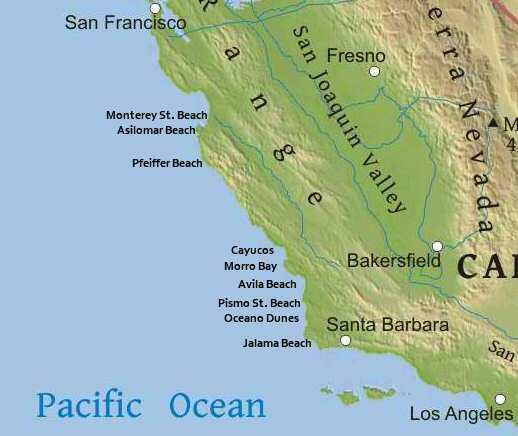 Visitors to Central California can find them freely available at nine area beaches. Boardwalks are another solution that allows you to get close to the surf with a conventional wheelchair. Nothing soothes like a day at the beach. Now and then, everyone needs a dose of ocean. It does a body good. And it really isn't limited to those with full mobility. But regular wheelchairs and walkers designed for hard surfaces just don't work in soft sand. So what to do? Fortunately, there are now many beaches with ramps, boardwalks, accessible facilities and best of all, freely available beach wheelchairs with flotation tires that make traversing the sand not only possible, but easy. An excellent resource for the entire California coastline is available at A Wheelchair Rider's Guide to the California Coast. It's one thing to sit in the parking lot and watch the surf from afar, and entirely another to be cruising right at the surf line. That's where the beach wheelchair comes in. I have found a list of nine beaches in Central California where these wheelchairs are available. It certainly makes sense to call ahead to check out the availability. And some of these chairs are available to be taken to other beaches in the vicinity. But again, checking this out beforehand will avoid disappointment later. Note: there is a motorized beach wheelchair available here and it requires a 48 hour notification for its use. What if the beachable wheelchair isn't available or the beach where you are doesn't have one? There are other options, and although they won't get you right down to the surf, it is still "being at the beach" which isn't a bad thing at all. 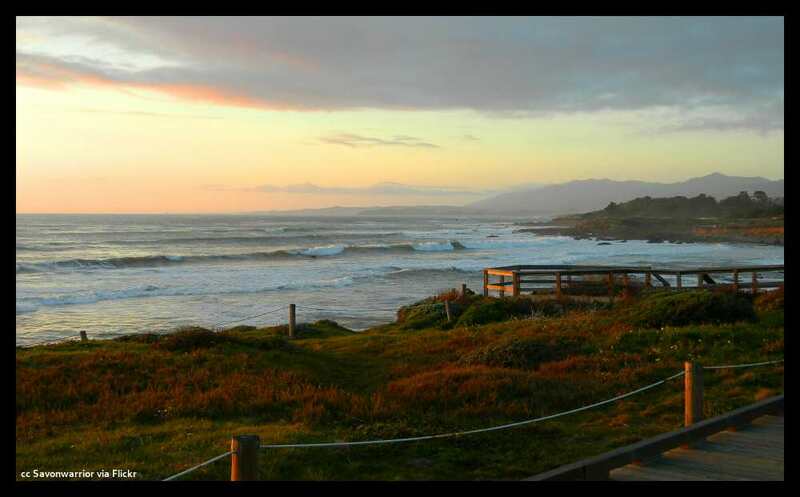 The boardwalk at Moonstone Beach in Cambria is one of the nicest around. In the photo above you can see the viewing deck perched right over the edge of the bluffs giving you a spectacular view of the surf and coastline north and south. 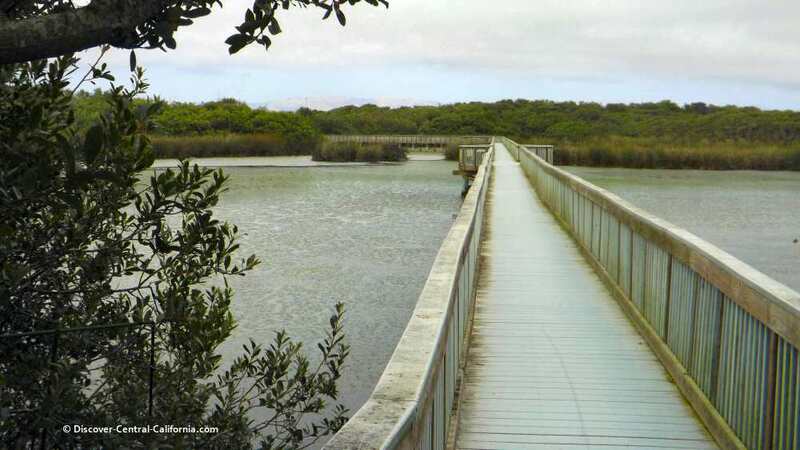 The boardwalk here is one of our favorite places along the Central Coast. It stretches about a mile along Moonstone Beach and is situated about 30 feet above the beach. It passes through an area of restored native plants and is very well constructed and easy to walk or wheel in a conventional wheelchair here. There are several large overlook decks which affords nice views of the beach and the rocks in the surf. The best thing here is that there is free parking all along Moonstone Drive and there are almost always spaces available. 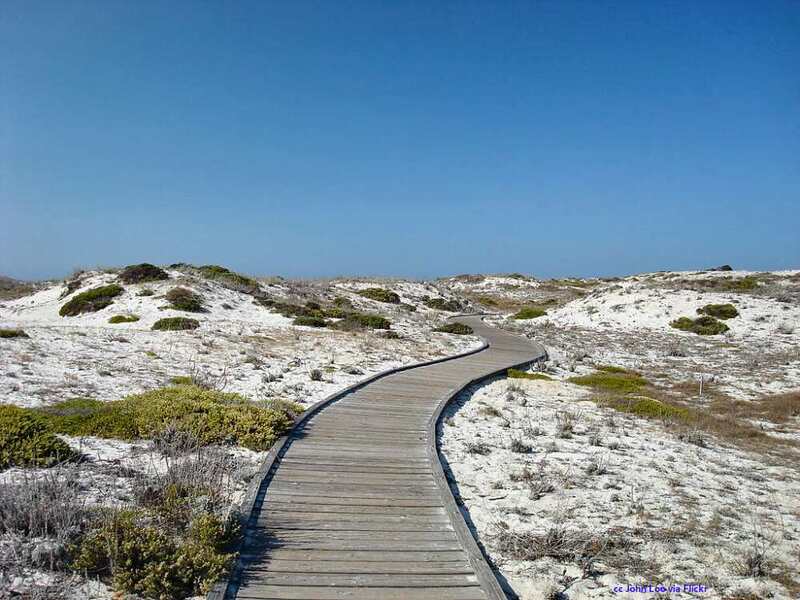 Another beach with a fine boardwalk is Asilomar State Beach in Pacific Grove. There is a beach wheel chair available here, but if it is in use, the boardwalk is a good way to see this beautiful beach. This beach is on Point Pinos which is also home to the Point Pinos lighthouse and is a very interesting visit. It is the oldest continuously operating lighthouse on the West coast. 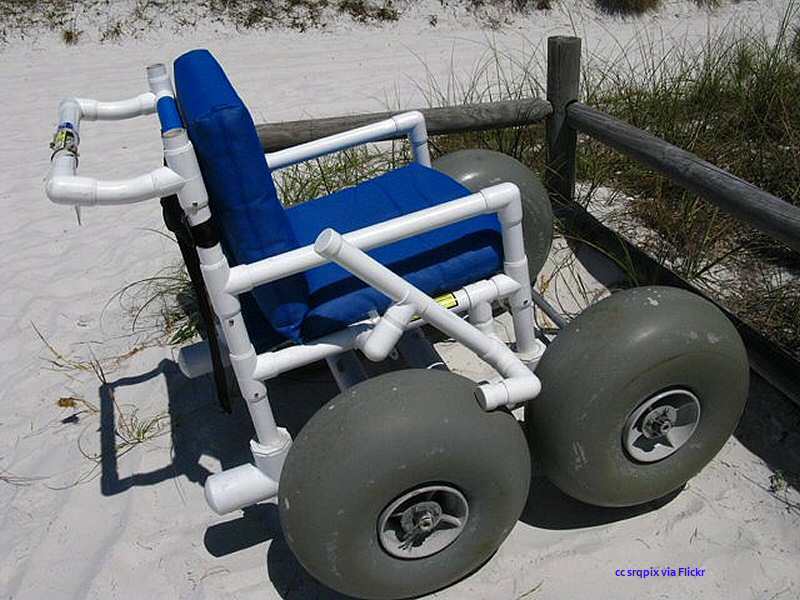 The availability of these wheelchairs is a great thing, allowing a freer access to the pleasures of the beach. We'll be covering the full range of accessible facilities at the beach on another page soon.